Folate Gold is a whole-food source of vitamin B9 concentrated from lemon peel. 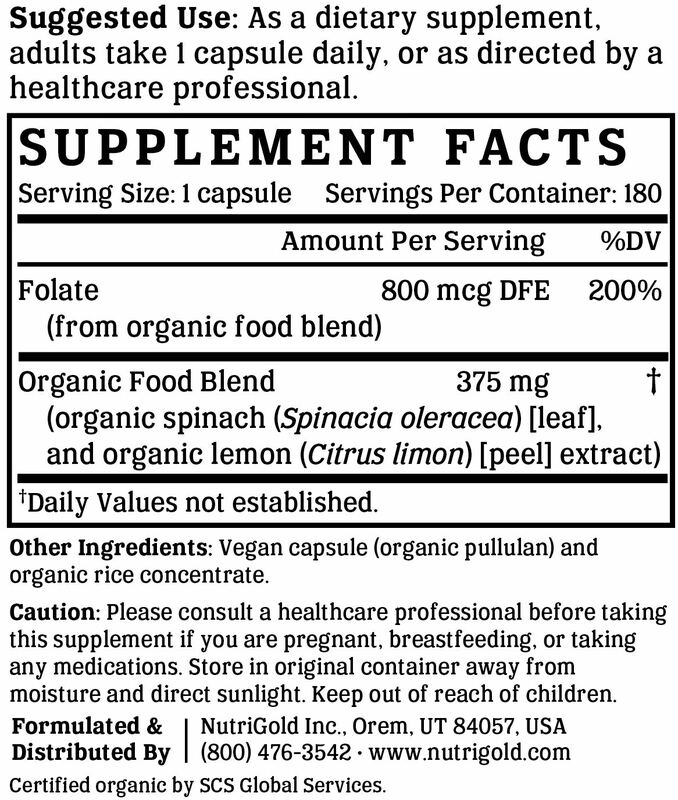 It does not contain any added synthetic, isolated folic acid. Folate Gold is manufactured in the USA to industry-defining quality standards and is verified by independent third-party labs to meet identity, purity, and potency label claims. Folate, also known as Vitamin B9, helps support a healthy pregnancy and fetal development. Additionally, folate helps support healthy protein metabolism, digestive and immune system functions, and formation of red and white blood cells. Research supports the use of folic acid to minimize risk of neural tube defects (NTDs), which are serious birth defects of the spinal cord and the brain, during pregnancy. It is important to understand the differences between folate and folic acid. Folic acid refers to the oxidized synthetic compound used in dietary supplements and food fortification, whereas folate refers to the various tetrahydrofolate derivatives naturally found in food; tetrahydrofolate (or THF) is the form of folate that can enter the main folate metabolic cycle. Unlike natural folates (from food sources) that are metabolized to THF in the small intestines, synthetic folic acid must undergo initial reduction and methylation in the liver, where it is converted to THF in the presence of the enzyme, dihydrofolate reductase (DHFR). However, because DHFR has low activity in the human liver, insufficient amounts of synthetic folic are converted to the THF form, resulting in unnatural, and potentially harmful, levels of unmetabolized folic acid entering the circulatory system. So, when adequate folate consumption from dietary sources is not an option, it is best to find a folate supplement made with food sources. Despite this, almost all commercially available folic acid supplements are synthetically created in labs from industrial chemicals, which not only have very low bioavailability, but are potentially harmful when consumed in high doses. By contrast, our product is a 100% natural source of Vitamin B9 as folate. The folate in our product is sourced from certified organic Citrus limon and is one of very few products on the market today that contains NO added synthetic folic acid. Folate Gold is Non-GMO Project Verified, which provides assurance that the product has been manufactured in accordance with the best practices for GMO avoidance. The Non-GMO Project is North America's premier verification program. Vegan Action has offered vegan certification since 1995. Their official seal is proof that Folate Gold does not contain ingredients derived from animals or animal by-products, is free of animal-derived GMOs or genes, and is not the subject of ongoing animal testing. Most consumers consider kosher products to be cleaner, healthier, or better than non-kosher products. The Ko Kosher symbol on Folate Gold is assurance of our brand's unwavering and uncompromising commitment to accountability, quality, and overall safety. We like to make supplements that can be enjoyed by everyone. That's why our products are always compliant with the best practices for avoiding allergens and minimizing cross-contamination. Folate Gold is free of soy, gluten, egg, milk, peanut, shellfish, and corn allergens. Consistent with our guiding principle to “do no harm,” Folate Gold is manufactured without the use of additives or preservatives. It contains absolutely NO contaminants, pesticides, herbicides, harmful additives, residual solvents, magnesium stearate, or hexanes. Like all NutriGold products, Folate Gold is subject to over 140 purity and potency assays by independent, third-party labs to ensure that the product meets or exceeds its claims. So, you can be certain that what's on the label is what's in the bottle. Nothing more, nothing less. No articles featuring Folate Gold have been published yet.